Gosh! Might I have turned on just at the right time? There were no comments when I first got here, I was so stunned I couldn’t think of anything to say!! And now look at it. I’ve been amazed several times by the discussion sparked by some initial comment of mine, usually not exactly earthshaking in importance. But that’s what these are for — I hope anyway. And now it looks like it’s your turn. Congratulations. While we were in England in September I was asked by numerous people about the drought. They were all under the impression that it was Australia-wide. I told them it was bad for farmers and graziers over large parts of NSW, QLD and some parts of Victoria were a bit short of rain too. I also told them that some members of the family in the SW of WA were having a very soggy time, hearing only today that everyone was suffering from cabin fever after such long periods of rain! We have been fortunate that our tanks and dams filled although it’s been rather dry these last few weeks. Some rain last week boosted the paddocks but more is needed. Time will tell. A dry period was useful a two or three years back; we were able to clean the silt out of the dam and channels. And much of SA and more than a bit short of rain. A recent trip through much of the mid-north left the impression that not a crop would be harvested for grain; all were in the process of being cut for hay. An astonishing number of eagles roamed around Burra, feeding off road kill, mostly kangaroos driven south by the want of grass. Wasn’t there a line, in South Australia, the Goyder Line, that was worked out, north of which was considered very iffy for cropping? In ‘good’ times farmers could move north of it but in dry times, don’t try it because the crops will come to nothing. Yes, there was. And it’s still marked on the road north of here. It’s been very dry and I’ve never seen so few flowers in the Flinders at this time of the year. Thanks to schoolboy South Australian Geography which has somehow stuck in my brain after a few decades, it was/is an astonishingly accurate representation of the 250mm isohyet, determined without really having much in the way of records to base it on. And the people not on farms need to remember that just because it rained doesn’t mean all the problems are over. Not everyone has had rain let alone “drought breaking” rain and there is still a fair road to recovery as farmers may be 6 to 12 months to get any decent sort of income and others will spend years to restock the rebuild their herds and their bank accounts! So we need to keep up the support, buy Australian every time!! That is so…the little bit of rain we had isn’t enough yet. I do feel for those whose livelihoods are so badly affected. To have to sell off or even cull good lines of cattle is heartbreaking. A local vet was heartbroken and worn out because of the number of brood mares he’d had to put down during the drought here that preceded the 2009 firestorm. We have some cattle here now that are fine stock from a dry area of Vic. East Gippsland is another area that has been short of rain…I’m told they are now setting up to deal with floods as that is the usual pattern there. My original comment was more to do with the media hype that gives the impression that the whole of Australia is in drought, which isn’t true. Send them this link, Annie. Australia is huge. Tropical 11 South to 44 degrees South at the bottom of Tasmania, spanning 33 degrees. The UK is 50North to 60North spanning 10 degrees, every bit far closer to the pole than any part of Australia. Flipped, the entire UK would be South of Tasmania. In Australia some tropical, some monsoonal, some temperate, some in the roaring forties, a lot of desert and 37,000 miles of beaches. It is 50x the size of England. Drought everywhere is unusual. The first question is, has the climate changed? The second is, which climate? The big question is, should we stop using and selling coal and gas and oil and save the planet? Who needs electricity anyway? Has anyone here been a professional user of 2-4D, the selective herbicide? I am observing some weird effects months after application. What weird effects? Personal or spray drift? Not that there has been a change recently (Oct. 3) in types allowed. I haven’t used 2-4D or 2-4DB for 30 years but we used to get residual control effects which theoretically weren’t supposed to happen, since they’re basically selective knock-downs. Because we had a lot of clovers in the pasture, 2-4DB was our main weapon of choice for broadleaf weeds. Same as 2-4D but it doesn’t convert to the toxic form in the plant tissues of legumes and leaves them untouched. I’m rusty and can’t remember what I once knew about that side of things. Thistles would not reappear for years though despite the fact that there must have been a considerable seed bank in the soil. Being hormonal, those chemicals are always a bit sus. We went away from chemical use except for a sea of Roundup and used mechanical controls as much as possible, but that approach is highly dependent upon local circumstances. What are you using it on and what weird effects are you seeing? Also, how are you using it? Boomspray or spot-spray? Are you sticking strictly to the directions or are you being a naughty boy? If you are spot-spraying you will likely be inadvertently overdosing the plants, which might cause weird effects. OK some have used it so I’ll give a little detail. A year ago I sank a bore and having plenty of water I laid some turf but the nut grass always shows with a bit of water. 2-4D, I recall from a previous life, is effective on nut grass but I also recall buffalo is not wholly immune so I spot sprayed being careful with strengths. The knock-down was pretty much as expected but as winter came I got large areas of yellowing. I dumped water on it and tried some fertiliser but it is only now that the grass looks OK so I expect the dead spots to grow back. Then there is the china-apple tree growing over the fence. A hardy, nasty prickly thing which was shadowing my mulberry and drinking it’s water. Maybe four months ago I sprayed what was easy from my side of the fence but it was a weak mix [I like my mulberry tree and so do the birds] I got poor results so reckoned I would need to get fair dinkum next time. But now it is dying off, even where I didn’t spray in spite of an inch of rain a few weeks ago. The time interval is similar to that on my lawn. Your bore water if you used it as the spray carrier is probably the answer to your questions. Minerals in the likes of some bore water can and do act to open channels in the plant which allows the chemicals to bypass the plants biological barriers and biological neutralising systems to various hormonal and selective herbicides. For most spray chemicals it is neccessary to use something like rain water purity to guarantee the required results. In fact with some herbicide chemicals there are occassions where a nitrogen based or phosphorus or iron and etc based ferilizer type spray additive is added to the herbicide mix in the tank mix to achieve the required results against specific weeds and yet still not damage the crop. It does become a delicate balanacing act at times particularly after rain with its high nitrogen content and other normally plant food contents which rain effects makes some plants much more vulnerable to effects from herbicides. Can’t remember any specific cases anymore as I have been out of the hands on farming game for close to a couple of decades now and agricultural technology has moved on at a rapid pace in farming technology over that period. Toxic chemicals killing people despite those same chemicals being responsible in large part for the increasing food production that is feeding ever more people. Destroying the planets soils, the same soils where their food comes from and has come from for centuries and will continue to provide food for centuries to come. And of course, the same ecoloons who want to stop farming and destroy farming to save the planet are building and covering vast areas of the best and most fertile land with thousands of totally useless mansions, highly fertile, high production soils which is why the first towns, now major cities were established there in the first place. Which of the following issues are the most important for the federal government to address over the next 12 months? Select up to three. Do you believe that there is fairly conclusive evidence that climate change is happening and caused by human activity or do you believe that the evidence is still not in and we may just be witnessing a normal fluctuation in the Earth’s climate which happens from time to time? As far as you know, do you think Australia is doing enough, not enough or too much to address climate change? Here are some things that the prime minister, Scott Morrison, has suggested or given his support to. Do you approve or disapprove of each of them? The results for “As far as you know, do you think Australia is doing enough, not enough or too much to address climate change?” is a sad indictment of the people. So it’s the opinion by the majority we need to do much more about climate change!!!! No wonder this nation is heading over the cliff. 63% say climate change is happening and is caused by human activity! Either the poll is way out or Australians are fools. I think its hard for most people. OK, lets take a step back – I think if what you see on shows like Gogglebox are ciorrect and it samples a representative part of the community, some people are a thick as bricks, some smart but have weird ideas, some plain ignorant, and some are just canon fodder. Now it gets a bit complicated. The influences on people can be complex. Assuming most of the media is marxist-captured, unless people truly are independent thinkers ( and there dont seem to be many of them ) then assuming maybe 20% of the population who may think correctly and arent too swayed by family and friends or peer groups, then that leaves 80% who either arent deep thinkers, dont have much free time to research, or are ignorant. So…if the most “trusted” news source is the left-of-Stalin Australian Bolshevik Collective, what hope do most people have? This is why I always advocate speaking to people within your spere of influence in pubs and clubs etc and putting them right. So I’m correct then, yay. I’d like to think that life, work, and lack of spare time might also have an impact on people understanding. Yes, some of them are thick, but even thick people can understand if its explained right….. I agree. I believe that the way to do this is to keep it simple and only present small amounts of info at a time. Always do this politely and listen to their comments. And avoid anything that sounds like conspiracy theory. I often wonder if they are stupid ( incapable of useful thought or actions ) or just un-educated about stuff? Most folks have a lot of things to worry about, and they hope that our government will sort this out for them so they can get on with their lives. It’s just too difficult for many folks. The Poll is broadly in line with other polls, including polls of Scientists, eg Stenhouse et al recently reported on WUWT. Given the extreme one sided position taken by the ABC, the Fairfax press, all of our Universities, the public service and all of our Scientific institutions and special Goverment institutions such as the Climate Change Authority, it not surprising that a majority Australians would think that Climate Change is a serious threat. Maybe they are not fools but have been mislead. Where will they hear or read the alternative view? An interesting question for me is why responsible people who should know a lot better have taken up the GAGW theme, eg Bernie Fraser (ex chairman of the Climate Change Authority). Bernie no longer gets a benefit becasue he resigned as chairman, but he has not expressed an doubt about GAGW, at least not publicly. At least most people probably know a climate skeptic by now. 25% in the survey said climate change is just normal fluctuation. That most be getting close to critical mass for skepticism to becaome mainstream. It is also encouraging that skeptical blogs such as JoNova enjoy a much wider readership than alarmist blogs like Skeptical Science (at least I think they do). how Murpharoo sees the poll! smart people believe in CAGW! The new Guardian Essential poll shows climate change – which was a significant factor in the Wentworth result – continues to be of concern to a majority of Australian voters. Just over half the sample, 56%, say Australia is not doing enough to address climate change, while 23% think Australia is doing enough. Voters between 18 and 44, and people with university education, are more likely to worry about the issue. Liberal National voters are split but they are more likely to think the government is not doing enough (45%) than the reverse. A comfortable majority – 63% – say climate change is happening and is caused by human activity, and 25% believe we may be witnessing a normal fluctuation in the Earth’s climate. Assessed by age cohorts, voters under 35 split 66%-19% and people aged over 55 split 56%-37%. People with higher education are more likely to think climate change is happening and is caused by human activity. The government has played down the need for a significant shift in its position on climate change before the next federal election, despite the strong protest vote in the seat of Wentworth over the weekend. (FINAL PARA) Voters were also asked to nominate the most important issues the government should address over the next 12 months. Voters said addressing cost of living pressures (60%), improving the health system (37%), looking at housing affordability (29%) and creating jobs and reducing unemployment (27%). I mean one might say they let anyone into university these days, but… They let anyone into university these days. Face it, if you are not STEM then yes I would like some cake with my coffee. Well the report from a well known Uni was released, showing basically people with room temp ATAR scores were being accepting into teaching. What hope do kids have if they are smarter than the teacher? So then, how’s that move to 50% renewables going in Queensland, considering they have to get there by 2030? It’s been two years and four Months now since that whole thing fired up in the State, so with only eleven and a bit years to go, they must surely be well on the way, eh! Well, on Monday just gone, 22nd October, the State of Queensland consumed 143,280 MegaWattHours of power. There are seven coal fired power plants in the State, and 22 Units in all. Three of those Units are off line currently, either being Upgraded (two of them) or undergoing maintenance. Just from coal fired power alone in Queensland, on that same Monday, those coal fired Units generated 136,800 MegaWattHours of power. So, 95.5% of Queensland’s power on the day was generated by coal fired power alone. Queensland regularly delivers (a lot of) power into Northern New South Wales via its two Interconnectors, so umm, I suppose that doesn’t count as power ….. FOR Queensland, but seriously, if the power is generated IN Queensland, then it should surely count as Queensland generated power. Now we all know that, umm, creativity will be used to make it seem that the State has moved to 50% renewable power. Or else they could just hope that everyone has forgotten all about it by then, eh! However, I can guarantee you this. In 2030 Queensland will not have 50% of its power sourced from Renewable power, no matter who says it is achievable. I trust that you kept copies of your submission Tony. yes, in hard copy and an online one of them is at the following link, and it’s a pdf document. There’s no point looking for it at the State Government site for their all singing all dancing plan to move the State to that target. They have, umm, taken the site down!!!!! 50% ‘unreliables’ by 2030 = Total industrial collapse (QLD). Dr Lynham said Queensland – where the state government owns and operates many of the coal-fired power plants as government-owned corporations – has no plans for “premature retirements” of coal plants. The Australian Energy Market Operator’s report says the retirement of coal power stations at Gladstone in 2029, Tarong in 2036 and Callide B in 2039 will remove 3780 megawatts from Queensland’s energy production network in 20 years. And probably add in a few “scheduled” or “approved” RE projects, to boost the numbers. Actually, if they really wanted to be sneaky,..QLD coud almost claim 50% RE next year . …so over 4000MW “nameplate” of RE which is getting close to that target ! They used to include the bagasse (cane residue) burnt in sugar mills to generate heat and electricity as organic and renewable. Don’t know if that is still the case but when it comes to manipulating figures never trust a Greenie! And unlike those warmist predictions, you, me, and the vast majority of people on this blog would happily guarantee that your prediction (based on practicalities) will happen. Roll on the election I say. We need a party with a bit of common sense and the cojones to implement sane policy. I think that has become a bit of a ‘mission for life’. I want to live till 2030 just to refer back to that document. I’ll only be 79, so I have a pretty good chance. I gather this data is only the wholesale market. Small scale solar that goes into the grid is only metered and paid for at retail level. It is invisible from a pricing perspective to the wholesale market that AEMO operates. AEMO estimate the contribution from small scale solar for scheduling dispatch able generation but they do not meter it or report on it. There are other non-wholesale generators contributing to the demand other than small scale solar. That is the cause of the slight discrepancy between the consumption and the sum of the wholesale generation and small scale solar. Going back to Monday small scale solar generated some 11550MWh in Qld. That figure is larger than the difference between coal generation and consumption you provided above because you are only considering the wholesale market. All small scale solar operates outside the wholesale market. It has priority access to the market and is only reduced if individual systems shut down on overvoltage. AEMO have no control over it. For a full three hours on Sunday small scale solar supplied more than 50% of the entire South Australian demand. This is really impacting the economics of wind generators in SA now. Wind was constrained from 0700 to 1130 and and 1500 to 1600. There was a lull in wind output through the middle of the day. Queensland is heading the same way as SA and will have skyrocketing power prices as more intermittent generation is permitted into the system. here’s how Essential’s ExecDir/Guardian columnist. Peter Lewis, sees the poll. CAGW is the ONE ISSUE WE’RE DEMANDING ACTION ON!!! Only last week in a speech in Sydney, Morrison was lauding Captain Cook as a man of “science”. Make no mistake, the battle lines on a culture war are being drawn. The irony of the science line would not be lost on those of us waiting to see the government take meaningful action on climate change – something that now seems deeper in the “too-hard-basket” than ever before. And that’s where the Coalition’s cunning plan will inevitably hit the rocks. For all his sound bites and stunts and too smart by half attacks on the opposition leader, the prime minister leads the same party that for the past six years has been incapable of leading ***on the one issue that the majority Australians is demanding action on. As he flirts with building new coal-fired power stations at the behest of his far north rump, the gap between expectation and execution will only broaden. Until the public comes to the conclusion there’s nothing new here. At best, a continuity with (no action on climate) change. THE END. The Guardian thinks its poll relates to all Australians?! I think not. Most people who read the Grauniad would be inclined to live in fear of (warming) climate change…poor dears. They might well be afraid of climate change when the next ice age arrives, with some reason by then. Last ice age 18,000 years ago and the Gulf of Carpentaria was a lake. I read that most Australian Aborigine survivors were camped around that rather large lake. Morrison has discovered the Overton Window? They are telling the young people there is no god, which is correct, and that the whole religious concept is badly flawed and unproductive. I should ask you to prove your statement El G! I don’t see that you can prove it one way or the other! Not trying to get into an argument here but that was a pretty bald statement. When the Chinese invaded Tibet in 1950 they found a population living in serfdom, under a repressive religious regime and 78% of the people were illiterate. Beijing set about building hundreds of schools and now only 42% are illiterate, presumably the old people. 78% of the people were illiterate. Beijing set about building hundreds of schools and now only 42% are illiterate, presumably the old people. Hmm.. Did anyone ask the Tibetans what they thought about all that? Isn’t it the case that the Chinese invasion changed the demographic in Tibet by moving many Chinese there and simply outnumbering the natives? Simply quoting stats is not really helpful. And I sure that none of the trees were cut down and exported, that would have been plunder and against U.N.rules. I hear that the Chinese have moved on to Tonga where they are now helping the locals with large development loans. Last week there was new piece of leading edge climate science published in Nature Plants. Decreases in global beer supply due to extreme drought and heat. I paid $11 to read this treasure. Under the RCP8.5 scenario, it was projected that average crop yields for barely would fall on average 17% by the end of the century. This would do crazy things to the price of a bottle of beer. In the UK, a 500ml bottle costs about USD2.35. That beer price is projected to double, despite the cost of barley making up around 5% of the cost. Most is taxation. In Ireland, where higher taxes mean beer is currently 15% more than in the UK, beer prices are projected to triple. Before taxes, the model projects in Ireland the 500ml bottle will rise by at least $2 more than in the UK. This is because of an assumption that breweries would not spot an opportunity in Ireland and undercut the competition. The models assume, countries have economic systems quite separate from their neighbors and that economic actors do not spot an opportunity. Similarly, then decrease in crop yields has wide variations from the global -17%. For instance in Canada around Calgary and Edmonton yields are projected to fall by around the global average. Along the Canada/US border yields are not forecast to change. But in parts of Montana and North Dakota yields are projected to double, less than 1000km south of where yields are set to fall. The craziest part is that farmers are assumed to continue producing the same as before. Those enjoying bumper profits will not try to increase output, and those seeing a drop in income will not try to move to something else or react in any way. The models take some climate model, feed the data into agricultural models to get yields. The yield data is fed into economic models to spit out beer prices. Unlike mainstream economic models, these assume that economic actors do not react in any way to price or profit signals. Rather than profit-maximizers, instantaneously adjusting plans to available information, we have farmers and brewers being totally ignorant of the changing business environment for decades. The projection beer prices are claimed to double in the UK and Australia is due to modelers who have not sense-checked their results. That should put Slim Dusty’s rendition of Pub With No Beer right back at the top of the chart. That’s probably the cleverest song I’ve ever heard. The very word pub means beer, yet Parsons turned it around and off it went. Maybe it will put a little cheer back into an otherwise tough situation for those going through one of natures toughest trials. Exactly — making Pub With No Beer a contradiction of itself. You would expect to get beer in a pub. I looked up the history and I hope I remember it accurately — the song apparently came about because a local pub had been drunk dry by a bunch of military men on a bender. Parsons was handed the idea by someone he knew and the song was born way back in the mid 1940s and when Slim needed a fourth song to fill up four sides and asked if he could record it, it was pressed into history apparently. It was the back side of something else but became the hit instead. It was the first million seller in Australia on those now hard to find 78 RPM records. Maybe I shouldn’t say this in these days of PC but I can’t imagine a song being written today containing the word queer. And maybe you can tell me, who or what is a publican, maybe census taker or tax collector? He (or she) is Mine Host in a pub! I’m glad I asked because I would never have guessed that in a million years. Except back East in a few places the term pub just isn’t a part of life. There are some theme places called a pub, usually Irish but if I had not been a reader and a movie goer I would never have heard of a pub. Hmm. Not exactly. A public house in the Scottish Highlands would only serve beer under sufferance. A wee dram or two five should suffice..
Well, there I learned something again. And the Hogues were Scotts. My grandfather changed the spelling from the Scottish Hogge to the British Hogue because he got tired of being called Hog according to family history. You never know what you can learn from some offhand remark around here. I should confess that his spelling change didn’t work because his grandson was called Hog anyway. Through the 70s & 80s you could hardly move in Scottish bars without bumping into MacEwan’s and Tennent’s lagers & darker beers. Brewery chain takeovers & closures have since largely diluted tastes with foreign brands. Och, they’ll do anything in the bailtean, ye ken? ..and how much barley goes in a pint of beer? Varies. A Pilsner recipe I found has 250g per liter. That is less about 120g per US Pint. The Daily Mail headlined with “Worst news ever! Australian beer prices are set to DOUBLE because of global warming“. May thanks for the link. I’ve known about that classic April fools day trick by the BBC for years but never ran across it. They don’t make them like that these days, although there is plenty on the BBC designed to fool people all year. Given the state of ridiculous prophesies dressed as climate science, people have lost a sense of the absurd. So people would no longer see the joke. Worst still, the BBC may end up making some people look a fool, or offend those who had previously believed spaghetti grew on trees. The BBC would then have publicly apologize and send the members of staff responsible on re-education courses. … believed spaghetti grew on trees. Keven, You’re just a font of knowledge today. I always thought spaghetti was made in a spaghetti factory by little Chinese elves imported from China to Italy by Marco Polo. On the other hand we know exactly where nonsense comes from (being polite lest Jo get mad at me) — climate change pushers. So the implied fiction here with the horror “beer becoming in short supply due to climate change” story is that the farmers and the agricultural scientists and plant breeders are so damn dumb and stupid, similar or maybe a level above the media journalists and editors of the media and of the Australian Bolshevists Collective [ I'll pinch that one Original Steve ] that they will not and cannot ever change and advance and adapt to any climate changes with their barley growing technology from this day forth. The utter bloody minded stupidity of these claims is absolutely mind bogglingly stupid and a damn good reflection on the abysmal mental calibre of the educated scientific idiots who made up and wrote up this paper and the even more simple minded idiots in the media who promoted it without ever thinking, [ Most of the media these days do seem to have the mental abilities of a sea cucumber considering the level of intellect that goes into most of their publications ] about what that simple minded, idiot level paper was actually suggesting, that the entire barley growing,malting, beer production industry was incapable of ever changing and adapting and advancing in the slightest from its present technology and beer production method forever into the far future. In economic models always absurd assumptions have been made. But after producing the model results there what-if questions were asked. In neoclassical economics these included people being profit-maximisers, have perfect information and instantaneously (plus costlessly) change plans to new information. Whilst absurd in the extreme, over long periods people do react to new opportunities or changed circumstances. Over 90 years, large changes in yields due to climate will cause a response from farmers. If individuals do not respond, or respond incorrectly, they will be driven out of business by those who make the right decisions. The economic models in climatology generally assume the opposite. The dumb economic actor assumption comes from a socialist view of the world that nothing good ever happens without the guiding hand of the state. It is not just beer prices. I recently looked at the projection, in a Government Committee Report of 7000 extra heat-related deaths a year in the UK by the 2050s. Within the figures, about half the projected deaths were of the over-75s in hospitals. The “dumb actor” assumption here applied to medical staff, who faced with decades of an increasing problem of patient distress due to heat do nothing about it. Even to the extent of not giving more drinking water, or providing cool bed baths. See here. Another example was of milk yields projected to fall due to increasing heat stress in cows. Again, the yields would fall because dumb farmers not taking action. That is basic action such as learning how Australian or Brazilian farmers cope with heat stress in their cattle today. One method is changing to more heat resistant breeds. Most of the projected costs of global warming are due to the assumption of failing to adapt. So if sea levels rise by two meters, it is assumed that people carry on as if sea levels were at today’s levels and are as surprised by the two meter rise if it occurs over centuries as if it the rise occurred over the course of a few days. I think at least some of us know ALP’s policy to increase renewables significant will not happen. It’s a bluff to appease a large proportion of the public who still believe in the CAGW story and that we must act accordingly. I don’t really believe people like Shorten are that stupid. The Greens yes but not the ALP as a whole. That’s why the LNP is still selling a similar message to reduce our em missions and also to appease the same people. It has become a game as to who can bluff their way to the next election without going too far or not far enough. It was always the case under Turnbull and nothing has really changed with Morrison. Sad really since I still believe Morrison has the time to convince enough people the truth about the CAGW hoax/scam and sway people to support the LNP and win the next election. Instead he has chickened out and risks losing by a landslide. Clearly he doesn’t understand and hasn’t experienced the “all-in” strategy of poker. Morrison is flying kites to get a reaction. Yes but each time he has been flying his kites they have been shot down in flames by conservative supporters if one listens to 2GB and watches Sky News. It is coming clear he is trying to be all things to all people, just like what Turnbull was doing. If he continues like that he will lose the next election by a landslide just as what would have happened under Turnbull. I’m still hoping Morrison will change but I’m running out of hope. We should know by Xmas. Phil mentioned that Abbott and Bernardi are talking, but I cannot verify. What do you make of it? Didn’t know that but I like it. I think Abbott knows things are getting out of control with the LNP and something drastic has to be done to save the furniture if not the party given Morrison is already turning out to be a complete failure. I’ll have to think on this and by the way its crossed my mind that Phil was just taking the ****. Current reports say that Morrison and Taylor are offering incentives for new coal fired power investment of which is the possibility that any future carbon tax that the Lab Green govt will introduce that the company’s will be protected from by govt subsidies or indemnity. What we must ask is why the desperate rush into renewables? Any fool, even some Greens, knows that variable supply depends on storage to be practical. Snowy 2 won’t be ready before 2024 assuming that the government project comes in on time (and budget) and it is the largest (and cheapest) form of storage. The rush seems to be an attempt to destroy reliable electricity generation. The other question I think we should ask is “If renewables are so cheap and wonderful”, why are 59 countries pushing ahead with over 1,000 coal fired power stations? In the first 9½ months of 2018, 368 scientific papers have been published that cast doubt on the position that anthropogenic CO2 emissions function as the climate’s fundamental control knob…or that otherwise serve to question the efficacy of climate models or the related “consensus” positions commonly endorsed by policymakers and mainstream media sources. Experts are finding out wind turbines are not only an inefficient way to produce electricity, but that they are also wrecking the environment, natural habitats and even the climate. An ever weaker wind is blowing across Germany. For example in the 1960s annual wind speeds of 3.7 meters per second were measured in Osnabrück, but now it’s only 3.2 m/s. That’s a drop of over 13 percent. Almost all weather stations in the country which were analyzed by the Bonn-based meteorologists at donnerwetter.de found that the trend looks similar. A variety of studies support the meteorologists’ assumption. “Danish research has shown that air flow is weaker than before the turbines even 14 kilometers downstream from a wind farm,” says Dr. Brandt. This is an effect that the operators of such parks are concerned about. If a new turbine park is built in front of an existing park in the main wind direction, the losses could be over 50 percent, American studies have shown. In northern Germany, there is now one wind turbine every 10 square kilometers. There are reportedly now something like a thousand local citizen groups in Germany who are opposing any more turbines being built in their areas. The [ non ] renewable chickens are really beginning to come home to roost in Germany with a vengence and the Germans are beginning to wake up to the gigantic con by the renewable energy industry. Graeme, why the rush to renewables? Savvy investors. Because as the legislation stands, the subsidies cut out in 2030. That applies to the RET certificates for large scale, and the rooftop calculation of how much upfront subsidy is received. Now I would like to think this is part of a massive revenge plan by the Prime Minister. Wait till Turnbull is elbow deep in Alarmists, allow him to wuffle on for the entire conference and then, before Turnbull has even left the conference centre, announce that Australia will be pulling out of Paris. Not THAT would be awesome. Alternately there is an active volcano on Bali. A slim hope but??? A VERY disappointing, wishy-washy display by Energy Minister, Angus Taylor on the 7:30 Report last night. All he did was stick to the narrative of the government focussing on lowering electricity prices. He refused to be drawn into meaningful discussion about renewables, carbon emissions and Malcolm Turnbull. The only area where he was even slightly critical of previous (ie Turnbull) Coalition policy was to say that he was always keen on containing electricity prices and that the country needed an Energy Minister that focussed on this (a very weak slap at John Frydenberg). This attempt to tread the middle ground and not offend anyone will not energize conservative voters and won’t convert the watermelons. You really have to wonder what the current government is trying to achieve. Plus he used the new buzzword, “firming”, for excusing renewables’ inability to provide power when needed (ie dispatchability) which is no better than the old one, “backup”. When will the excuses stop and renewables be made to honor contractual bids like the rest of the market? The waffling from most of the politicians is disgusting. They have plans, what plans, well plans, ok but what exactly, emissions reduction targets, so how will you achieve the targets, we have plans ……. The sad part is most of the waffling is coming from Morrison of late. Sales and marketing background, church congregation motivator = hyperbole and puffery a speciality. PeterS. I’m an American. I’ve seen the word “spill” used when discussing Australian politics. What exactly is a “spill” and what is its etymology? I envy your system in that respect. Impeaching a US President is so much more difficult, and so it should be, than having a spill here. For what it’s worth, it takes more than impeachment to remove a President. As I understand it, in criminal law conviction of an individual for a serious crime is a two-step process. First, a Grand Jury indicts the individual. That is, a Grand Jury formally accuses a person of a crime. A trial follows an indictment. The accused is convicted and sentenced only if the trial finds him guilty. Impeachment, which is the responsibility of the House Of Representatives, is equivalent to a Grand Jury indictment. If a President is impeached, a trial takes place in the Senate where guilt or innocence is determined. For example, Bill Clinton was impeached by the House of Representatives; but the resulting Senate trial found him not guilty so he remained in office. Many years ago I saw a chart of the steps involved to get rid of a US President. It looked like a much more sophisticated and complex version of Monopoly. Here we can do conduct a spill very quickly, much like Tic-Tac-Toe (aka Noughts and Crosses). Impeachment is a political process, not a legal one. But what I don’t understand in the US is why house and other leaders seem to have jobs for life. Pelosi has overseen massive dem losses at all levels but seems assured of keeping her job next year. First, a Grand Jury indicts the individual. That is, a Grand Jury formally accuses a person of a crime. Please correct me if I’m wrong, but isn’t it true that a person can be accused and indicted by a Grand Jury with no evidence at all, other than circumstantial, with no possibility of defending themselves and no legal representation, and can then be held in custody pending trial? Something of a blunt instrument to be wielded by the DA? That’s my understanding of how it works in California, at least. It seems a little heavy handed to me. I’m not listening to the ABC interview, because I stupidly listened to Angus Taylor on 2GB this morning. why is it so many Coalition politicians sound like they are in a tunnel, or on a speaker phone, or worse, when they are on 2GB? it’s almost unlistenable…and definitely incomprehensible. the Govt has already forced suppliers to inform people when their discounted plan is up for renewal so, when Taylor goes on about that, it’s plain rubbish. it took me less than 5 minutes to renew my plan. Energy Minister Angus Taylor tells Alan Jones not all Australians have the time or the negotiating skills to make that happen. “There is a loyalty tax which customers are being hit with. “Customers who have stuck with a service provider and not got on the phone to get a better price, then we get slugged. “We’re saying that’s not good enough. “This will be a fair price for customers who don’t have the time to get on and negotiate. Alan warns Minister Taylor that all of these measures are ignoring the bigger issue. “The way out of better prices for electricity is to stop demonising coal-fired power. “We’ve got to stop closing coal-fired power plants,” says Alan. Pat it’s not a tunnel but a mass grave they are digging for themselves. I had hopes for the guy when from initial statements when he was given the Energy portfolio but last night’s performance (or lack thereof) shows him to be little better than Frydenberg. I now hope Abbott leaves the Liberals and joins Bernardi to build up a true conservative party to represent us properly. I’ve been hoping Abbott would do that for some time now. Perhaps the performance of Morrison of late is going to force Abbott to do just that and bring along with him a whole swag of others. It’s time we have a strong third force given the LNP has lost the plot of being a conservative party. It would also give voters a clear choice unlike the confusion we have trying to distinguish the two major parties on so many fronts. To be fair, Analitik, Leigh Sales was trying for a gotcha on “how much money will come off people’s power bills?” as if everyone’s goddam bill is precisely the same. Given she interrupted him several times asking for the exact amount of dollars – and she probably wanted cents as well – that would come off every single power bill in every household in Australia, he was on a hiding to nothing. it’s almost unlistenable…and definitely incomprehensible. Oh, I don’t know. I could definitely comprehend that Angus is now quite capable of mastering doublespeak. He is now a true politician. And we’re stuffed. The Loop is ready for a test run in Los Angeles. Nice but will be too expensive and unsafe for others while vehicles are entering and leaving those large holes on the surface roads. I’m waiting to see who will win the race; driver-less cars or robots that will drive our cars. The advantage with the latter is older cars can be driven by the robots. Of course the cost is a factor but the robot can perform other duties, like house duties, etc. Actually not a world I’m looking forward to for a couple of reasons. It could never compete with the new Chinese bullet train, carries more than 1200 people. On the question of robots, China wants to lead the AI charge. Other duties – like these? The Prime Minister Scott Morrison speaking to the media at a gelato business in Canberra announces that former prime minister Malcolm Turnbull will represent the Australian government at the Oceans conference in Bali. “This decision was taken weeks and weeks and weeks ago..this decision is in the national interest..former prime ministers continue to have a role to play to serve our country,” Mr Morrison says. The Prime Minister denied that his relationship with the former pm has soured. the almost inaudible question at the end is about whether or not Morrison’s relationship with Turnbull has soured, to which he answers with a firm “no”. TURNBULL SHOULD NOT GO TO BALI. PLUS AT LEAST $400MILLION OF THE $443MILLION SHOULD BE RETURNED TO THE GOVT BY THE GREAT BARRIER REEF FOUNDATION NOW. So he was invited by the President of Indonesia ScoMo claims? Australia signed and ratified the UN IPCC Agreement and the Bali event is a UN function. Turnbull is now an ordinary citizen, no longer in the Parliament, so isn’t it insulting to Indonesia and others that our government has chosen not to send a Cabinet Minister or Prime Minister? Loss of face is a big deal in Asia. That’s the best part of it. Australia can disown anything he says and he won’t have a government cheque book [English spelling] or credit card in his pocket. That’s great fun Dennis…I loved it and have sent the link onto the family. Thanks Dennis the kids won’t forget that song in a hurry! Years ago, (while I was still at school actually…good grief!) I made up a ditty to that tune as a way to remember the defects of eyes and lenses (groan!). Fit it into the tune, cringeworthy my effort may be but I have never forgotten them. You use the formula pi r squared! Wow Annie you were an early Ned Flanders. That was great. The look on the kid’s faces was priceless. I check most days to see if anything’s brewing on the Great Barrier Reef Foundation scandal – like a demand that they return the money – but there’s usually nothing worth posting. With growing concerns about the toxic effects of chemicals and plastics in the natural environment, and whether or not manufacturing labour is ethical, we investigate sustainable practices and reliably sourced, eco-friendly homewares and materials. PIC: Ocean Plastic Knobs by Vert Design studio for Spark and Burnish are constructed from plastic collected from the ocean. This article first appeared in Houses magazine. Foundation has a terrible website. the knobs must be expensive if $10 from each goes to the Foundation? Treat yourself to a little Reef-tail therapy and these generous organisations will donate a portion of their sales proceeds to the Great Barrier Reef Foundation for Reef research. I seriously asked that because one of the advertisers involved produces loo-rolls and wondered if the same produced the Aldi offerings as we buy those. He also pioneered the use of ribbed sheet music. Actually, on the whole, I prefer “Sorbent”. Looks like my old hometown is getting some batteries that will keep the lights on at a handful of homes for a few minutes when the wind isn’t blowing or it’s a bit cloudy. AusNet managing director Nino Ficca called the battery a “watershed moment” for the state. It’s certainly a watershed moment for AusNet. “Integrating this technology into our Ballarat Terminal Station means it is well placed to enhance the stability of the state’s energy supply, especially during the coming summer peak demand period,” Mr Ficca said. Straight out of PR central. Nobody who tells the truth talks like that in real life. EnergyAustralia chief executive Cath Tanna said batteries will make the grid more reliable as coal plants retire and is replaced by wind and solar power. “That’s where utility-scale batteries come into their own by storing wind and solar energy for quick release, keeping the lights on and costs down,” Ms Tanna said. So you’re admitting that renewables are unstable and expensive. How is a state supposed to attract and keep industry when there’s no reliable source of baseload power? Unfortunately this is almost destiny, because the Liberals lack the spine to solve the problem at its source. So they’ll lose another election and Victoria will be stuck with a tribe of rabid socialists determined to eliminate the jobs of the unionists who support them… They’re clever, but not that bright. Environmentalism: Every once in a while, environmentalists will let slip that the goal of fighting climate change can’t be won unless capitalism is first defeated. The fact that there’s no evidence to support the claim doesn’t seem to matter. Fong isn’t the only one making this claim. Naomi Klein’s 2014 book titled “This Changes Everything: Capitalism vs. the Climate” argues that the planet is doomed unless the world abandons “free market” ideology. Assume for the sake of argument that everything environmentalists say about global warming is true — that the computer models are perfectly accurate in predicting future warming and that the result will be entirely negative. Is capitalism to blame? Let’s review the evidence. Free market economies have become far less carbon intensive over time. Data from the United Nations show that the U.S. emitted 62% less carbon for each dollar of GDP produced in 2014 than it did in 1990. In Hong Kong, which is ranked as having the most free economy, its carbon intensity dropped by 58% over those years. What about more socialist countries? Communist China emits 86% more CO2 per dollar of GDP than does the U.S.; Russia emits 50% more. Worldwide, carbon intensity has steadily dropped since 1990. Those were years when free market capitalism was spreading, and the trend started long before the world was taking climate change seriously. Why? Because even without any government oversight, free markets reward efficiency. And one of the biggest sources of waste is energy use. Trying to increase profits, therefore, invariably means less energy use, and less pollution, including CO2. Free markets are also inherently “sustainable” because businesses want to stay in business. That means making sure resources are carefully managed for the long term. Socialism, in contrast, is dirty business. The Soviet Union was a horrendous polluter, as were other Eastern Bloc countries. “The socialist world suffers from the worst pollution on Earth,” noted Thomas DiLorenzo back in 1992. Here at home, the federal government is the biggest energy consumer and polluter — despite being free of any profit motive. The simple truth is that, as long as there are people on the planet, they’re going to need and want things. The best, most sustainable, most earth-friendly way to deliver those things is through free market capitalism. Click here for more Commentary and Opinion from Investor’s Business Daily. There seems be a problem with “testing” though. The Our Ocean conference starts in Bali on Monday. It promises to bring together heads of state, ministers, and “champions from various backgrounds” to “influence concrete and actionable commitments to preserve the oceans’ health”. Former foreign minister Julie Bishop backed the decision and said many nations sent former leaders to such conferences. “Malcolm Turnbull has a deep and abiding interest in the oceans, in the environment, in climate change,” she told reporters in Canberra. Mr Morrison also said Mr Turnbull may be sent to additional conferences “where there’s an opportunity and it’s in Australia’s national interest”. Further to Dr John McLean about poor historic temperature records, I offer a systematic approach to test the effects of adjustments. 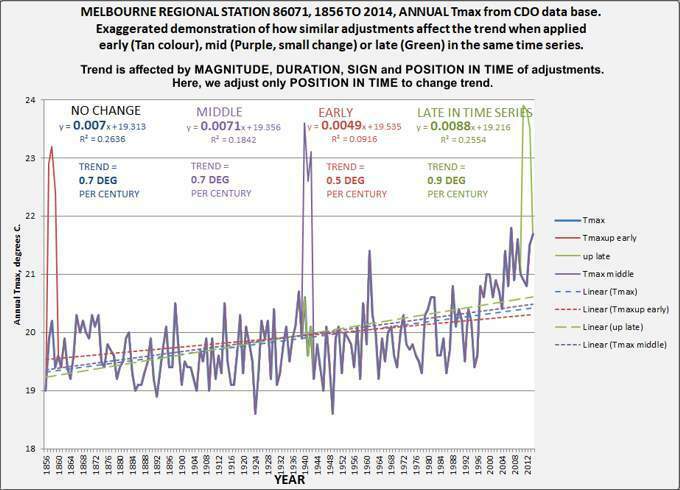 In any temperature/time series, the trend is affected by adjustment duration, magnitude, sign and where in the time series the adjustment site, early or late. I drew the following graph to show the latter effect, which AFAIK has not been incorporated into any tests of homogenisation effects. If anyone has the data bases to test adjustments, nationally or globally, it is past time to do so. House Republicans postponed a closed-door interview with Deputy Attorney General Rod Rosenstein originally scheduled for Wednesday. The midterms are less than two weeks away. If Rosenstein doesn’t appear before House Republicans before the midterms and the Democrats take the House, goodbye oversight. Rosenstein previously demanded his interview be held in a SCIF (Sensitive Compartmented Information Facility) with multiple Republican lawmakers excluded. Gowdy and Goodlatte gave in to Rosenstein’s demands. It is also important to note that both Republican lawmakers announced their retirement and will not seek reelection in the 2018 midterms. Catherine Herridge reported Monday that Rosenstein’s transcribed interview will be withheld from the public for a prolonged period of time because it must be reviewed by the intelligence community before it is released. When Rosenstein’s interview is finally released to the public, it will have redactions. Freedom Caucus Chairman Mark Meadows (R-NC) blasted Rosenstein for demanding his interview be held in a classified setting. Trey Gowdy is a bit of a legend, a sharp mind and a willingness to call out BS when he hears it. Some of the Youtube clips of him in various committees are priceless. Yet fewer than one in ten contributors to a landmark UN report on the science of 1.5C global warming launched this month were African, of whom many were based at universities outside the region. The problem starts with patchy raw data. “Climate change is based on long term observations of weather patterns,” says Murombedzi. ***BUT WE KNOW AFRICANS ARE THE MOST VULNERABLE TO CAGW! FROM A PDF ON FUTURE CLIMATE FOR AFRICA: FCFA is a £20 million (US$30 million) programme funded by the UK Department for International Development (DFID) and Natural Environment Research Council (NERC). It promotes the use of improved medium-to long-term climate information in development projects that are being designed today. Disclosure: Coleen Vogel, as an academic, receives funding from various funding organisations. UK Power Networks (UKPN) is set to undertake the UK’s first trial of Faraday Grid technology to boost flexibility and efficiency as more renewable power projects come online. The innovative technology, developed by Edinburgh-based Faraday Grid, is designed to be installed into existing electricity grids in order to balance the intermittency and volatility of renewable generation. Comprising a network of independent Faraday Exchangers, the technology enables the autonomous self-balancing of the network, making it better equipped for new energy demands driven by trends such as the rise in electric vehicle (EV) chargers. Scotland-based company Faraday Grid has signed a deal with British distribution network operator UK Power Networks for it to trial its potentially ground-breaking technology, also called Faraday Grid. Ian Cameron, head of innovation at UK Power Networks, said he recognised that “Faraday’s technology has the potential to be transformational for distribution networks and the wider energy system”. Faraday Grid’s Exchanger technology lived up to its goals of improving power quality and reducing losses on distribution networks. “Antarctica has postponed summer, as winter refuses to loosen its grip. Antarctica New Zealand (ANZ) staff had been due to fly to Scott Base on October 1, but a series of storms on the southern continent meant it was now hoped the first planes would leave Christchurch on Monday – two weeks late. It’s happened again but this time to Bridgette Mac Kenzie , ABC ask if you have any aspirations of the top job in the Nats so she clearly responds “NO” , and of course in ABC speak NO means she wants a tilt at the Nats leadership . None of these questions have been asked to Labor or Green just the Nats, also Mac Kenzie is pondering a tilt at Indi electorate for a seat in the lower house . Spokesperson for Kathy Mac Gowan insists the Mac Kenzie has no chance because the Independent has the seat and the support of those in the seat , not the case at all . Mirrabella was the most hated politician we have ever had so it was a matter of who was hated the least won the seat and if the Nats make the move and contest the seat they have a good chance of winning . So what has become of Marty Corboy? At midday small scale solar is suppling 639MW out of 1153MW demand or 55%. From 1130 to 1430 small solar met more than 50% of the demand. The wind generators had their output constrained through a good portion of the daylight hours. That is despite having the capability to export 600MW into the Vic market. Increasing small scale solar at household level is beginning to hurt the grid scale wind generators. It must be reasonably easy for those supplying the money how this all plays out. The owners will be lobbying hard for the higher capacity link to NSW. The wind farm owners will be lobbying hard for a link to NSW, but who will pay for it? SA can’t, I don’t see NSW wanting a large supply suddenly appearing in the remote SW corner and having to be transmitted a thousand km to the main users, so that leaves the Federals. Will Labor spend on this white elephant as well as the rest? Who do you think will pay for it!! Electricity consumers of course. It will be part of the grid upgrade that AEMO has in the ISP and will be financed through debt with the asset owners making their 15% return on investment. This simply maintains the ever upward trend in electricity cost. They’ve gotta get money from somewhere. Rick, how do we know when the wind output is being restricted deliberately , and not just dropping due to lack of wind ? It is highly variable at best of times, and i find it hard to believe that SA would keep the gas generators going at 1+ GW and restrict wind output at the same time , as often appears the case. Direction from the AEMO. South Australia MUST keep enough gas generation going to prevent another State wide blackout, so gas generation only varies but is never allowed below a certain point. When the wind blows a small amount is used in SA, then enough to eliminate imports from Victoria. The answer is “export it to Victoria (at a low price)”. So the interconnector is for balancing supply. The public get stuck with the bill. From the Wentworth Report and with special reference to Australia’s fuel security and world oil prices. I could imagine a super tanker going around Australia. Visiting Kwinana, Melbourne and Brisbane and returning to fill up again with sweet crude. Put a refinery doing diesel and AVTUR on the Port Hedland mainland to service the mines and we are good for at least another thirty years at current useage rates. This will give us insurance till we master MSRs using the world’s waste nuclear material or our own uranium and thorium as fuel. With unlimited power and heat, we can quite literally make fuel out of air or more likely LNG and/or lignite. We can make as much fresh water in inland Australia where both artesian water and ground water in the Murray Darling basin is too salty. This field is proving up to be every bit as big as Bass Strait. Don’t export it , keep it here…we need it bad! I could imagine a super tanker going around Australia. Visiting Kwinana, Melbourne and Brisbane and returning to fill up again with sweet crude. Will never happen. Coastal shipping in Oz is prohibitively expensive. It’s the same with LPG, no matter how much gas is reserved for domestic consumption there will never be seaborne trade. It is cheaper to export it and buy it back out of Singapore. First, AM interviewed Jane Caro , a global warming crusader who said she might run against Abbott. AM also featured three other guests, all critics of Abbott or his policies: Louise Hislop, who at the last election worked on the Warringah campaign of independent James Mathison; Paul Oosting, head of the Leftist GetUp! ; and John Daley, head of the warmist Grattan Institute. “If the former Prime Minister decides to run again, he’ll be up against psychologist Marie Rowland, who has announced her candidacy for the Nick Xenophon Team. “But it will take a ‘political miracle’ to win Warringah—a blue ribbon Liberal seat which has never been held by a woman. The evidence is overwhelming and I was on the Intergovernmental Panel on Climate Change that reviewed the evidence back 1995, and I’ve kept looking at the evidence and you know, the one mistake we made in 1995 was that we didn’t anticipate how fast things were going to change. EMMA ALBERICI: I want to know how you explain the politicisation of climate change as an issue, given so many well regarded economists like yourself indeed — the Nobel Prize in economics has gone to William Norhaus this month, who has pioneered a framework for understanding how the economy and climate interact — and yet on the other side we have this politicisation of the issue such that if you want to reduce carbon emissions, certainly in this country, you’re a green leftie. And if you agree that it is all a bit of alarmist nonsense, then you’re really a true conservative. JOSEPH STIGLITZ: Yeah, I really, it is a little bit of a puzzle. You know, there are special interests who make a lot of money out of fossil fuel — coal, oil companies — and they have an economic interest to try to persuade people that its hokum, that it is a liberal conspiracy. It’s not. I mean, even in the United States, responsible conservatives have come forward and said we need a carbon tax to discourage the use of carbon — but they’ve recognised that we need, people have George Shultz have recognised that we need carbon tax so the reasonably centre, what you might call the old Reagan Republicans have recognised that climate change should not be politicised. Ahead of the Columbia University economics professor’s visit to Australia to collect the Sydney Peace Prize, he acknowledged that Australia’s record-breaking 27 years of uninterrupted economic growth owes much to the mining and export of fossil fuels. Coal and iron ore are Australia’s top two export earners. This financial year they are expected to generate more than $110 billion in foreign income. Stieglitz says the IPCC have grossly underestimated the impending doom that awaits us . re Fannie Mae. Oh my! Stiglitz seems to have little comprehension of the science involved in all aspects of the mining cycle, from concept exploration studies through to post-production mining rehabilitation. From experience, this hard science is performed quietly and competently, in contrast to the silly kiddy games played by much of climate science. Even spellcheck doesn’t like him, what do you expect from an economist trying to be a climate scientist I suppose . I thought economics was the only discipline required to be a “climate scientist”. Oh, and palaeontology, of course. Mustn’t forget Tim. WHO WILL HOLD ABC TO ACCOUNT FOR THE CHINA COMMENTS OF THE MIGHTY JOSEPH STIGLITZ? Though all collieries in Xuzhou have closed, the city’s main mining firm continues to produce large volumes of coal, coal chemicals and coal-fired power, running projects elsewhere in China as well as Bangladesh and Pakistan. And while provinces such as Hebei and Shandong have set targets to cut coal use and convert heating systems to cleaner natural gas, others are still approving new coal-fired power plants. Coal-fired power has remained the cheapest and most readily available option for many local governments, with many already struggling to find enough natural gas to supply local houses with heat. China’s mainly coal-fired thermal power capacity rose 58 gigawatts (GW) from the end of 2016 to the end of August this year, more than half of all new domestic capacity over the period and almost enough to power Australia, NEA data showed. “With renewables ramping up so quickly, it has given the illusion of decarbonisation, but China is falling into the same trap that Germany has fallen into – deploying lots of renewables that have to be backed up with lots of coal-fired power plants,” said Li Ning, nuclear scientist and dean of the College of Energy at Xiamen University. “If nuclear can’t keep up, then it is coal,” he said. 212 of the “wooden wonders” were built in Australia though they really had some problems. In the end, no matter what they did, the wood and glue just did not hold up well in the tropical environment where the aircraft had to be used to engage the Japanese in the CBI and S. Pacific. I hope that those who want to return that revolutionary aircraft to the air are not so set on tradition and adhering to the original specs that they don’t replace the original glue and sealants with modern adhesives and sealers to combat the ravages of time, moisture, and oxidation. After all, the aircraft they’re restoring will only be the second to be able to take to the air of the few that remain in existence. I don’t think many people realize just how important the Mosquito was in so many roles. Several RAF bomber squadrons were equipped with “pregnant Mossies” with widened bomb bays to carry the 4,000 lb. “cookie” light case blockbusters deep into Germany. Night after night they helped keep the pressure on when the heavies were either grounded due to weather or busy elsewhere. That being said, I would put the Spitfire at the top of the list of Iconic WW II British aircraft. Well, both the Spitfire and Mosquito weren’t wanted by the Air Ministry (along with the Hurricane, Wellington and the Lancaster). They tried to stop the Spitfire twice until the publicity got too strong so they switched to demanding all new fighters had to have elliptical wings, which shoved up the cost for a marginal improvement. Bear in mind that there were really 3 Spitfires with redesigns. The original Spitfire 1 cost £19,000 vs a Messerscmidt at £4,000. A little known fact was that the German TA154 was to be a “Mosquito killer” but the British bombed the Goldschmidt factory and they couldn’t get a suitable glue for their plywood with results as reported. And so the Aussies and Kiwis struggled on for much longer than necessary with the P-40. At least they got the Beaufighter which did excellent work. Another wooden wonder that still exists today is the USS Constitution. Did you know the US government maintains a protected grove of trees, specifically Live Oak, so that there is a supply dedicated for keeping that ship original as close as possible to her 1812 specs when they periodically overhaul it? There were primarily 4 types of wood used in her construction but today Live Oak is very rare and that was the wood used for the hull and structural bracing that gave the ship it’s legendary strength. India has 292 operating coal-fired plants and a further 41 under construction, emitting more than 1000 million tonnes of CO2. Facts don’t lie — between 2016 and last year coal-fired generation in the Asia-Pacific region increased by 330 terawatt hours, contributing 66 per cent to increased electricity supply. That is the equivalent of 33 Hazelwoods. These power plants will burn coal, so the options are: do they burn the cleaner, more efficient, higher-energy coal from Australia or do they burn the second-rate, poorer quality coal from overseas that will put more CO2 emissions into the atmosphere? ***We can achieve much more by looking after our farmland (the soil that has to grow our food for thousands of years) and increase the storage of carbon in our soils by good management. As Christine Jones, an expert in regenerative land management, has pointed out, if farmers balance the magnesium and calcium levels in our agricultural soils we can increase soil carbon. Do this over our 450 million hectares of land, increasing the soil carbon by 3 per cent, and that will neutralise our emissions by 100 per cent for ­almost a century. This will achieve CO2 abatement and protect our food supply. That is a real solution — a win-win. David: Onya Wacka!! Let’s get the hell out of the Paris agreement and start using and developing all the resources this country is blessed with. ***don’t know about his solution, but most commenting are with him on coal. 2 Oct: AfricanArguments: What’s the real story behind the Botswana elephant deaths false claims? While “conservation” is usually seen as a progressive cause in the West, it is often despised in Africa as just more (white) colonial land theft. In Breitbart, I read endless comments that Trump is Hitler. That’s the problem with modern progressives. They have as little knowledge of modern history as they have of science. Adolph led the National Socialists, the NAZIS. The AntiFA group are the brownshirts of the fascist socialists. Book burning was in vogue too, as in Mao’s China and Pol Pot’s Cambodia. Complete intolerance of ideas. No, the increase in CO2 is not man made. That is demonstrably wrong. So there is no man made global warming but there is a serious assault on all Western democracies underway, by the UN, the EU and the communist countries. The irony is that as our electricity bills go through the roof, we are all paying for it, against our wishes. That kind of hyperbolic BS and the mobs is all the opposition has. Day after day the leftist media organs struggle to come up with new talking points and insults. Day after day they conspire with the democrats to try and bring Trump down or failing that weaken him. And day after day they not only fail but his popularity is increasing even by the measure of their own skewed polls. In the end their problem is that they have no new ideas on how to make things better for the average citizen. All they do is resist everything the current administration is trying to accomplish and ignore those that are having very positive effects. Not happy with insulting Trump and the members of his administration, they have also been repeatedly insulting every voter that supports him. It’s like they could not see how damaging Hillary’s “Deplorables” statement was to her election campaign and instead are doubling down on such insults. It really is grade school playground stuff. I would like to think it has no effect, but repetition is the key. We had the same with a scripted attack on former PM Tony Abbott as a misogynist. Totally without justification, it is just smear tactics. The guilty party again was the media who just loved it. I understand that the media are a little left, but the CNN attacks on Trump are beyond belief. We will see how it affects voting in the half term elections in November. He was met with LOUD CHEERS at the arena at the University of Nevada, Las Vegas. When I watched this earlier today I noticed something was odd; the background sound and the responses from the visible audience don’t align with the visual as presented. Rosie Memos: Forgot to mention J Balvin (who has 24 million followers) and SaltnPepa performed a FREE concert before the grand flatline-ale of O.
Monday night, President Trump held a rally for 18,000 in Texas, with thousands more gathering outside. CNN refused go live to the president during the rally. when FakeNewsMSM call u a “rock star”! Former President Barack Obama’s recent speech attacking Republicans and the President — though he never mentioned Donald Trump by name — was widely covered by the media, seemed like it was a must-see/must-attend event for Democratic Rep. Jacky Rosen, currently struggling against incumbent Republican Sen. Dean Heller. By the media’s account, Obama was surrounded by energized Democrats and enthusiastic voters. The bleachers behind him were packed to the brim, and the people in front were numerous. Uber’s chief executive, Dara Khosrowshahi: “It represents our wanting our partnership in London not only to be a strong partnership but trailblazing in solving air pollution, which every great city in the world is struggling with, and our mayor here in London is looking to improve,” he said. All this is aimed at eventually replacing car ownership itself. Uber is also offering a diesel scrappage bonus of £1,500 in credit for its app to the first 1,000 people in London to scrap a pre-Euro 4 diesel vehicle. His references to “mankind” are a little dated (hello, half of humanity!) but the key messages have stood the test of time. It is depressing that a situation Vincent “Ċensu” Tabone presented as “urgent” in 1988 continues to deteriorate three decades later – albeit with some causes for hope. Malta’s foreign minister was the first to put climate change on the agenda at the UN General Assembly on this day, 30 years ago. It would be easy to conclude that the UN has failed. The pioneers of climate diplomacy certainly underestimated the countervailing forces. But the process started that day did eventually, in 2015, yield an international pact that most of the world – don’t mention the US, or indeed Brazil – is committed to. This is the link to the transcript. I could not link to the full interview film. What I find amazing with these discussions is the tacit acceptance without any sort of proof that the steady increase in carbon dioxide in the 20th and 21st centuries is man made. “Putting more Carbon dioxide in the air”. Sure Michaels raises the lack of tropospheric warming, the equatorial hot spot, the greening of the planet, the inbuilt biases in the models,the total failure of the models but accepts the most outrageous idea, the tacit acceptance that the steady CO2 increase is man made. This acceptance is almost universally true, even among famous scientists and sceptics. In fact it is the most outrageous fallacy. Sure they go on to debunk the alleged warming effects of CO2, especially in the first half of the 20th century, but almost universally accept the premise that the CO2 increase is man made. Why? Why apply all that logic after accepting the fallacy of a man made global carbon dioxide increase. It does not even rate a mention. The IPCC pushes this same fallacy by ignoring totally the rapid exchange of gases between the oceans and the thin air. Then the total lack of correlation between CO2 levels and 30 years of vast expense in reducing CO2 levels. They still measure human ‘emissions’ without demonstrating any correlation between human ‘emissions’ and CO2 levels. After thirty years and the building of 350,000 windmills with no effect, the advice is to build more, faster. There is no attempt at evidence or measuring the results of what has been done. We just told to do more, much more without any evidence that we have done anything at all. There is almost no fossil fuel CO2 in the air. That should end every argument, but people seem to love to talk profoundly about everything else. Consider all the fish in the sea. They all have to breathe exactly as we do. Oxygen in and Carbon Dioxide out. So where do the fish get their oxygen? Why don’t they run out of air and drown? It happens in a fish tank quickly enough. As the presenter says, hotter water can hold less oxygen. It’s all obvious stuff. So everyone knows how rapid the exchange of gases really is, how essential but according to the IPCC, it doesn’t happen. CO2, O2 are trapped on each side of the water and ice world which covers 75% of the planet. We just know it isn’t true. Then if CO2 moves quickly and freely, what determines how much stays on each side? Henry’s law. Given that the amount of CO2 in the ocean is 50x that in the air, it’s game over for man made CO2 levels and man made Global Warming. Warmer water means more CO2 in the air, not the other way around. Still people just accept CO2 levels are set by motor cars and coal power stations. Why scientists accept this is a real puzzle. Then if CO2 moves quickly and freely, what determines how much stays on each side? Henry’s law. CO2 does not move quickly and freely in the oceans. The mixing depth is no more than 100m. Diffusion is a very slow process. There is never equilibrium because the ocean surface temperature has a range of 30K and is moving via currents across vast areas over decade long periods. The ocean surface has cooled in the last two years but CO2 continues to increase at the same rate as the previous two years when the surface was warming. It is not far off RoySpencer’s UAH satellite data. The CSIRO model captures ENSO better. For some reason the Russian model does not even have the 1998 peak despite that being before the CIMP5 model runs. Although most models and the average are diverging from reality, the Russian and CSIRO models are reasonable. Probably a few more years before they are fully discredited unless there is dramatic cooling sooner without some obvious cause like a volcano cloud. It seems we’ve all been suffering a delusion regarding how science really works. A priest teaching philosophy and climate science is ketting us know how science really works. Thanks for posting that link Mary E.
Can’t say I didn’t enjoy reading that while enjoying my morning cuppa . . . . .
Just got a letter from my values supplier of electricity advising of the new tariffs at the end of my contract. Line items going up a lazy 33% to 65% , with a nett increase if applied to my last bill of 46%. I feel churn coming on. I have sent them a no thanks, if you can do better let know message and we will see what happens. I suspect not much.